The bone tissue of the jaw begins to decrease immediately after tooth loss. A successful installation of implants without sufficient jaw bone volume cannot be performed. To solve the problem, Burbank sinus lift surgery is performed for implantation on the upper jaw. 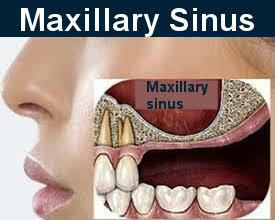 Maxillary sinus floor enlargement, which is also called sinus graft, sinus lift, sinus augmentation is a surgical procedure. This procedure can be performed by dental professionals who are specially trained in the area of bone augmentation and implant dentistry. 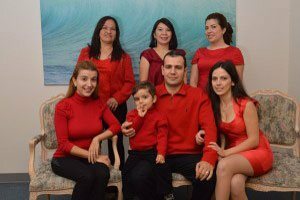 If you have a missing tooth, Dr. Sahakyan, the best dentist in Burbank can help. Call 1-818-578-2332 for an appointment today. Grafting the floor of the maxillary sinus has become the most frequent surgical interference for growing alveolar bone height prior to the placement of dental implants in the posterior maxilla. The results of this procedure may be affected by particular surgical techniques. One-stage versus delayed implant placement, use of barrier membranes over the lateral window, choice of graft material, and the width and length of the implant and the surface characteristics. In What Cases Is it Necessary to Perform a Sinus Lift Surgery? In the case of implantation of the front teeth on the upper jaw, for which the indicated problem is especially urgent, it is necessary to perform a microsurgical operation to restore bone tissue – sinus-lifting. This procedure allows you to create the necessary bone volume by introducing the material for bone growth at the most important points under the maxillary sinus, which is not injured. After a while, the injected stimulant grows into blood vessels and becomes a normal healthy bone. This new bone makes a solid foundation for fixing the dental implant. 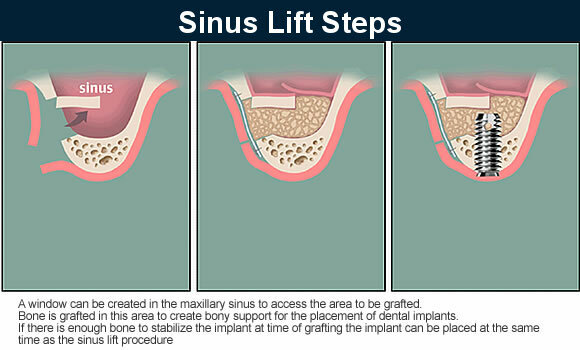 Sinus lift surgery is a complex procedure for increasing the volume of the bone at the site of implant placement. Sinus lifting is used when implanting teeth. It is mandatory when it comes to future implantation in the lateral sections of the upper jaw. Inside the upper jaw, there are the so-called maxillary sinuses, which are cavities lined from the inside by the mucous membrane. The lower border of the sinus passes near the tips of the roots of the lateral teeth of the upper jaw. The removal of these teeth causes a decrease in bone density in the region of the bottom of the maxillary sinus and leads to a slow lowering of the sinus floor. This leads to a decrease in the height of the alveolar process of the jaw and the impossibility of installing implants. Construction of a 3D model of the jaw. Calculation of the required volume of bone material. Execution of the model of the jaw and surgical template. Sinus-lifting with implantation of teeth involves the following manipulations. Preparing a hole in the gums and bones. Peeling of the mucosa of the maxillary sinus to raise the bottom of the cavity. Filling the formed space with the osteoplastic material. Sewing gums or installing an implant. 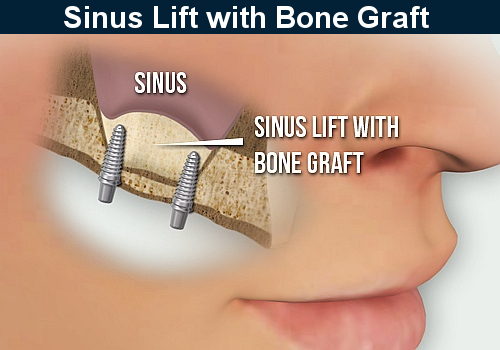 Several different types of bone-grafting materials can be used with sinus lift surgery.The bone used in a sinus lift may come from your own body (autogenous bone), from cow bone (xenograft) or from a cadaver (allogeneic bone). The choice between them will mainly depend on how many millimeters in height it is necessary to increase the height of the alveolar process, raising the bottom of the maxillary sinus. This depends on the length of the implant the dentist Burbank decides to install so that later there is no overload during chewing. The dentist Burbank determines the length of implants and correlates it with the height of the alveolar process over the maxillary sinus. Then, it becomes clear to him which method of sinus lifting is best to use for the particular patient. With a bone height of seven to eight millimeters, a closed sinus lifting method is used. With this method, there is no cutting of the tissue. It involves simply the movement of the bottom of the maxillary sinuses through the puncture hole. Further, the dentist forms the bed for implant placement. To increase the volume, the hole is filled with granules at the same time. This technique is used if no more than 1-2 implants are planned in the projection of the maxillary sinus. This technique allows achieving a more significant increase in bone height in the area of planned implantation. If you want to work with a bone, a height of less than 7mm, use an open method. First of all, the dentist Burbank produces an incision in the gum and balances it. The next step is a careful raising of the bottom of the maxillary sinuses. Through the hole made, a special artificial material is introduced a bone substitute. At the end of the stage, the dentist places an exfoliated gum and sutures the incision. Rehabilitation after the procedure may take several months. The enlargement operation is performed separately from implantation of the prosthesis. In total it takes quite a long time. All surgical procedures are performed under local anesthetic. The difference between these methods is that closed sinus-lifting is a more gentle intervention. The sinus bottom at the same time moves through the implant bed with the help of a surgical cutter or osteotome. If the sinus lift is open, the filling of the cavity with the osteoplastic material is carried out through a small window made in the sidewall of the sinus, while using specialized instruments for sinus-lifting. What to Choose: Open or Closed Sinus Lifting? Open sinus lift surgery is much faster than the closed one. With significant bone atrophy, open sinus lifting is the best option for a guaranteed successful outcome. If you want to recreate a bone in a small volume, it is better to choose a closed procedure. It is less traumatic and can be combined with the installation of an implant, which significantly reduces the recovery time of lost teeth. Take anti-inflammatory drugs and antibiotics prescribed by a dentist. Dr. Sahakyan performs sinus lift surgery when there is insufficient bone in the upper jaw to allow room for dental implants. The sinus-lift procedure will create a bone mass. It will enable dental implants to be placed and stay in place for many years. If you need a lift procedure, Dr. Sahakyan will ensure you understand what is being done. Please contact our dental office at call 1-818-578-2332 today.